When people’s kidneys do not function properly, they need to undergo dialysis treatments on a regular basis in order to remove waste and toxins that would otherwise be harmful. No one looks forward to having to undergo these treatments, but without them kidneys would fail and people’s lives would be placed in a position of immediate danger. One of the most important components of any dialysis treatment is the concentrate that is used to move the process forward and to help clean out the system. As such, companies have been putting products on the marketplace to help with this need. One product that penetrated the market deeply in recent years was known as GranuFlo, which was manufactured by Fresenius Medical Care. GranuFlo was used widely across the United States and for a time it seemed to work quite well for those who were using it with their dialysis treatment and under the supervision of their doctors. Unfortunately, reports eventually began to surface regarding serious problems that were allegedly associated with GranuFlo. Specifically, the most serious problem was that GranuFlo allegedly put people at risk of suffering cardiac arrest if it was not prescribed and managed properly. The reason was that one of its active ingredients that the body converted to bicarbonate was apparently too prevalent in the mixture to the point where patients were accidentally overdosing on it. When people’s systems contain too much bicarbonate, it increases the risk of cardiac arrest. In 2012, Fresenius Medical Care voluntarily changed the labeling on its product that specifically warned people of this risk of cardiac arrest. Despite this step, the FDA later issued what is known as a Class I recall of GranuFlo. A Class I recall is the classification that is used for products that allegedly pose the most serious dangers to people, including serious and permanent injuries and in some cases even death. As such, GranuFlo is no longer used, but that doesn’t mean that everyone who has suffered from trusting it have properly protected their legal rights. Some people may not realize that they suffered a cardiac arrest because of the use of GranuFlo, but those who did while undergoing kidney dialysis could have reason to evaluate their legal rights and options. People in this position should take this step with the help of experienced GranuFlo recall lawyers who can provide them with the legal analysis they need and the guidance they deserve as the decide how to proceed. National Injury Help has been helping people who were unwittingly harmed by defective products across the United States for decades. The firm has dealt with and held accountable enormous corporations on behalf of individual consumers. If you or someone you love has suffered a heart attack while you were undergoing dialysis treatment, find out what concentrate you were using. If it was GranuFlo, you should contact the attorneys at National Injury Help, today to schedule a free initial consultation. 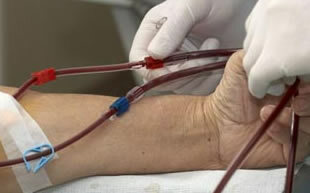 GranuFlo is prescribed for patients on dialysis. Chronic kidney failure affects nearly 2 out of every 1,000 Americans and without working kidneys, people are forced to undergo hemodialysis, which is a procedure where a machine removes toxins and waste from the blood and then returns it to the body. GranuFlo powder concentrate is a drug called a dialysates that is essential to the dialysis process. What are the side effects linked to GranuFlo? Was there a recall for GranuFlo? Why was there a recall for GranuFlo? The FDA issued this recall because doctors were not accounting for the additional bicarbonate to administer separately. Because of this, patients could potentially be at risk for the effects of excessive bicarbonate, which is linked to heart problems.